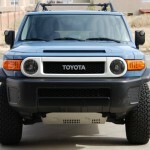 Bumper wing eliminators are replacements for OEM bumper wings on the Toyota FJ Cruiser that either get their wings knocked off or owners who decide they are more aesthetically pleasing. It’s a reasonably cheap replacement till you can afford a real bumper. I’ve been selling them since late 2007. They are aluminum diamond plate, bolted on with stainless bolts. Easier to apply than stick-ons, and completely reversible when you are ready to go back to stock for resale. The fit is a bit large in the front to cover the slots for the original end caps, but IMHO they look pretty good as long as you don’t get overly critical. 😉 The scratches on my bumper that you see in the pictures are a result of getting the template right, sliding back and forth, etc. $75 per set includes stainless mounting hardware and shipping. Note: Seconds are $50 per set and have minor flaws (scratches or speckles) in the powder coating. 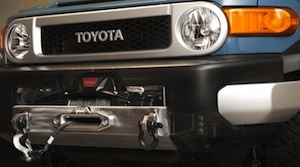 Combo package with Lower Grill Insert available here. Any finish listed in the pulldown menu is ready to ship. For any other finishes, enquire using the Contact Form.